Well, here is the news I didn't post the other day. Mgr Bruce Harbert, the Executive Director of ICEL is leaving his post, and his successor is to be another Englishman, my friend Fr Andrew Wadsworth, a priest of the Diocese of Westminster, and a noted enthusiast for the Extraordinary Form. I don't suppose Fr Wadsworth will have much to do with the Missal now, it being mostly complete, but there is still lots of other things to be done, notably the Breviary. Merciful Lord, we offer this gift of reconciliation so that you will forgive our sins and guide our wayward hearts. We ask this through Christ our Lord. Ask what? The 'prayer' was a statement. It didn't ask anything, simply stated the reason for offering the gift. Our prayers are with Fr Wadsworth in his new job. My apologies for the picture; it's the only picture of Fr Andrew that I have. 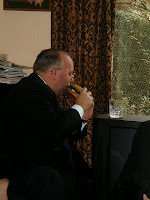 It shows him after an EF Mass in Guildford some ten years ago tucking into Bruno's (my chocolate labrador's) squeaky hamburger. I've lately been passed a book on the Sarum liturgy and customs to read. It raised for me an interesting question which I hope somebody reading this might be able to help me with. In any number of guide books to English cathedrals and also liturgiological texts, you can find the rood screen referred to as 'the rood screen or pulpitum'. This has led a number of authorities to conclude that the Gospel and Epistle were read from the top of the rood screen. This is patently absurd: I flatly refuse to believe that. If you look at the various examples of surviving rood screens, if they can be ascended at all, this is done via a narrow staircase accessed by a door, often as little as three feet (=1 metre) high. Possibly the rood screen at Salisbury (destroyed by Wyatt in his 'restoration') had more convenient access, but somehow I doubt that there would have been any dignified way for crucifers, acolytes, subdeacon and deacon, all vested and carrying bits and pieces, to have ascended to the top to sing their parts. It would at least have presented a comic sight. My Latham's Revised Mediæval Latin Word-List (a marvellous book) has 'pulpit…ambo'. Can it be that this long fantasy of the words of scripture being proclaimed from the top of the rood screen is simply that, a fantasy, and is a pulpitum simply, er, a pulpit? Or a lectern such as the splendid original one in the middle of Merton College Chapel which we actually used for the reading of the Epistle and Gospel in the celebration you can access on the left? I'd be really interested if anyone has any further information about this. My suspicion is that a lot of research on the Sarum liturgy was done by Victorian Anglican rectors with plenty of time on their hands but no experience in actually performing solemn liturgy—that didn't really come in until the twentieth century, I think. Having never tried to sing the Gospel from a rood screen, the sheer impracticality didn't occur to them. Other things don't seem to have struck them, such as the fact that the nave in great churches (those with solid rood screens, on the whole) was not used for the gathering of large congregations. But more perhaps on this in another post. Some of the sharper-eyed among you noticed that very briefly I posted some ICEL news, but having been advised that I was a little premature and should wait for an official announcement, I took the post down again. It doesn't (directly) concern the new translation, in case any of you were getting anxious. Several people have recently noticed that I haven't been posting very much in the last few weeks and have, one way and another, expressed concern: please let me reassure you that I am fine, just very busy in the parish (and the seminary seem to think this is just the time to unload lots of marking [US, grading] on me)! But thank you very much for your kindness. All will soon, (please God) be back to normal. I'm sure that most, if not all, priests will agree that that this is the most exhausting time of the year, and with three churches, I find this particularly so. But by mid-June, things calm down agreeably, once our children have made their first Holy Communions, and our teenagers have been confirmed, and our converts have been converted. A few years ago, I had three years of obligatory idleness. However exhausting this is, I find busyness preferable. Thanks to Richard for the link. As so often, the erudite Fr Hunwicke has got me thinking. So often it happens that historical circumstances force the Church to think through things that have never been thought through before. In our own time, the situation of the St Pius X society has brought to the front just what it might be that constitutes a Council: what solemnity is attached to its teachings, doctrinal and disciplinary, and what degree of submission is required by the faithful in order to describe themselves as Catholic (or indeed O/orthodox)? Must Bishop Fellay and his mates subscribe to every jot and tittle of every document of Vatican II in order to be defined as a Catholic? My friends will tell you that the matter of what makes or doesn't make a Council infallible has been going round in my mind for some time. Fr Hunwicke has simply encouraged me to write about it, since he is obviously on a not dissimilar tack. 1) The word 'council' is a very loose one. There were all sorts of councils in the early Church, regarded as more or less authoritative. In one case in the 4th Century, a semi-Arian council of three hundred or so bishops was held to be overturned by a little council of, I think 24, organized by Athanasius in Alexandria. With hindsight, of course, but I think that this is really the key to status. There is another criterion of solemnity when one comes to Ecumenical Councils. These are councils of the Ecumene, of the world, or at least the parts of the world held to be important (which effectively means the Roman Empire—I never heard of Celtic or Persian Christians participating in an early Ecumenical Council, though I stand to be corrected). The first 'ecumenical' council is generally agreed to be Nicæa, 325. But what made this any more authoritative than any number of other councils around the same time? Did the participants believe it to be so, just because there were more bishops there than before? The West was not very strongly represented. The actions of some participants subsequently (such as those of Eusebius of Nicomedia) suggest that the answer is no. One possible answer is that the participation of the Bishop of Rome is the sine qua non for a council that is universally authoritative. And it is certainly true that the Popes or their representatives have taken part in all the councils regarded as 'Ecumenical', though also, presumably, some not so regarded. There are parts of even ecumenical councils that are now disregarded. Mostly on disciplinary matters, of course, and yet they still have anathemas attached. So what is their status? What, for instance is the status of a bishop who breaches the prohibition of moving from diocese to diocese, this being analogous to adultery? (Nicæa). But then, even a participant of Nicæa, Eusebius of Nicomedia (he had been in another diocese before Nicomedia, too), moved to Constantinople very shortly after the council. 2) Then there is the matter of the preamble and canons. Most councils formulate their material into a discourse followed by canons. The canons at the end are the bits that are considered necessary for a Catholic to believe; they usually conclude anathema sit (condemning those who hold the contrary to the assertion). The preamble is important, but does not require the submission of mind and heart that the canons do. Vatican II is different. Bd. Pope John XXIII declared that it was to be a 'pastoral council', and therefore that there were to be no anathemas. The consequence is that we have all preamble and no canons. And we find people giving canonical weight, infallible status, to the entire text of Vatican II: something that I suspect we would never have had, had there been canons. 3) The additional problem is actually that those who insist so hard on adherence to the letter of Vatican II are probably far less adhering to its letter than Bishop Fellay. I suspect that Bishop Fellay believes and teaches far more of what is in the documents than do some of his detractors. The things his opponents mean by 'Vatican II' are not really the documents and their contents, but the post-Vatican II 'spirit'. There is more, illustrated by the Nestorian schism, which will follow when I can get up the energy. And lest I be accused of heresy or something, if I err, put it down to ignorance. I entirely submit to the judgement of the Church and will rejoice to be corrected. Sorry for the long silence; the press of parochial and other matters rendered it inevitable. Having celebrated the first Mass of Sunday last night at Upper Beeding, I returned home and went to sit in front of the television for a while. I don't do that very often, but I'm not feeling on top form right now. There was an edition of Time Team being broadcast—perhaps you saw it too. For those outwith these shores, Time Team is an amateur archaeology programme which can, if you're in the right mood, be quite entertaining. This week the team were excavating two little chapels dedicated to St Michael at Looe in Cornwall. They correctly drew attention to the fact that there are a lot of chapels on the top of hills in the South West of England dedicated to St Michael—St Michael's Mount being the most famous, no doubt parallel (though they didn't say this) to the more famous Mont St Michel over the other side of the Channel. One of these little chapels was on an island in Looe Harbour, over a treacherous and rocky little bit of sea—there were stories of many pilgrims drowning on the way. The island is identified on 16th Century maps as being 'St Michael's Island' but for some reason is now 'St George's Island', perhaps because it was important strategically at the time of the Spanish Armada. For more information on the island, go here. The chapel on the mainland mirrored the island chapel almost exactly, and it was suggested (probably correctly in my opinion) that the mainland chapel served as the focus of the pilgrimage when it was simply too dangerous to risk the short sea crossing. This suggests that the pilgrimage there was for one day only in the year, otherwise surely pilgrims could have waited for a calmer day. They found in the chapels a full tomb in the floor before the altar on the island, and in the mainland chapel floor a corresponding, but much smaller, space, which they supposed to be a sort of reliquary. Well yes; this lends support, I think, to their theory that the mainland chapel was a sort of foul-weather spare building. If the tomb contained some significant burial, then some bones could be kept in the tomb in the mainland chapel for the veneration of pilgrims. Enough: to the point of the post. An expert was asked the reason why so many churches were dedicated to St Michael on the tops of hills, and the reply came that, well, he was an angel, and angels fly, so they wanted to be nearer him (I'm paraphrasing). Well, I didn't think much of that. The thought suddenly flew (as it were) into my mind that the Sarum Liturgy keeps a feast of St Michael in Monte Tumba, on October 16th, as it happens, when sea crossings might very well be risky. In various translations of the Sarum Missal I have seen, this feast is generally translated as 'St Michael in the Mountain Tomb'. However, a little research reveals that the feast really is St Michael in Monte Tumba—i.e. 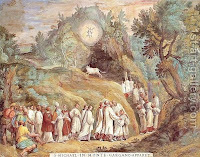 the apparition of St Michael on Mount Tumba in Apulia—now called Monte Gargano, or Monte Sant'Angelo, (see it here) near the sea, as it happens, where the apparition is commemorated on May 8th each year—a rather balmier season. If you fancy making a pilgrimage, it isn't that far from S.Giovanni Rotondo, so you could take in Padre Pio as well. Apparently the spot was originally sacred to Mithras, which might account for the tomb reference. The shrine is still functioning; you can make a virtual tour here. The account can be found in the Bollandists, 29th September, Vol 8 (you can now find the whole Acta Sanctorum on line) and is related in Jacobus de Voragine's Golden Legend. To Michael's dramatic later intercession, appearing with flaming sword atop the mountain, in the midst of a storm on the eve of the battle, the Lombards of Sipontum [=Manfredonia] attributed their victory (May 8, 663) over the Greeks loyal to the Byzantine emperor, and so, in commemoration of this victory, the church of Sipontum instituted a special feast honoring the Archangel, on May 8, which then spread throughout the Catholic Church. Since the time of Pius V it has been formalized as Apparitio S. Michaelis although it originally did not commemorate the apparition, but the victory of the barbarian Lombards over the Orthodox Greeks, faithful subjects of the Byzantine Emperor in the East and the patriarch of Constantinople, and thorns in the papal side. So that's why Rome keeps it on May 8th. I have no explanation of October 16th [but see a very interesting contribution by Gem of the Ocean in the combox]. And, I am satisfied, that is why there are so many shrines to St Michael on the tops of hills and near the sea. * The second nocturn of Matins of saints' feasts, until the mid 20th-century reforms, usually consists of biography, or, better, hagiography, and sometimes strays, shall we say, into the legendary.